The story of Red Soil Through Our Fingers takes place against the backdrop of Hellas-Dao, a Mars colony owned and operated by the Rekos-Breland Xenomaterials Corporation (RBX). Though the setting is obviously fictional, I wanted to make sure that I incorporated much of what we already know about Mars and what future Mars colonies might look like. Though I have a background in aerospace engineering, neither Mars nor Mars colonization architectures were my area of expertise. The process of researching defining the setting for the novel was a lot of fun. 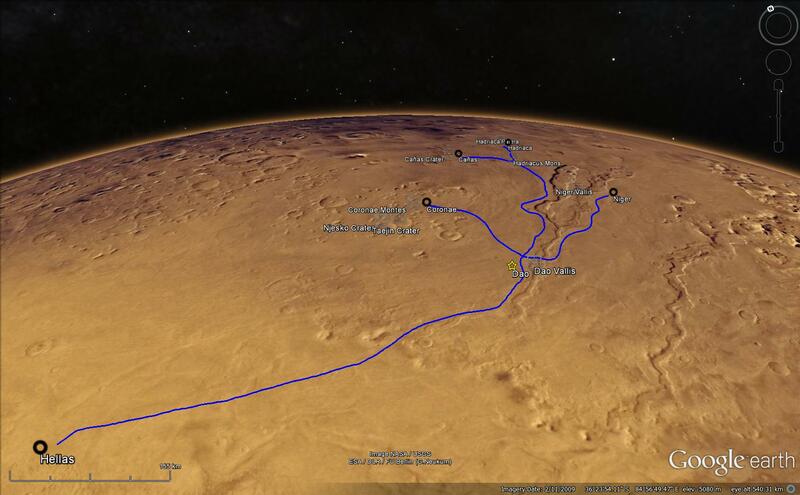 I started by doing some research about Martian geography, using scientific papers, photographs from the Mars rovers and orbiters, contour and water maps of the surface, and spending a lot of fun hours nerding out on Google Mars. The photographs especially gave me a great sense of the aesthetic in my head as I was writing. 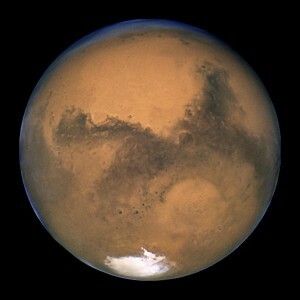 Some people see Mars as barren and sparse, but I think it’s beautiful! It reminds me in many ways of the deserts of the western United States, three of which I have lived in. The southern hemisphere’s rugged highlands appealed to me aesthetically, especially given the many thematic allusions in the book to the historical frontier of the American West, so I “settled” on the region containing the Dao, Niger, and Vichada Valles as the backdrop for the novel. In the novel, the RBX corporation has established their colony in the northeast periphery of the Hellas Planitia, a large, low-lying impact crater that forms a basin in the southern hemisphere. The low-altitudes at the bottom of the crater (over 7000 m below the datum) mean that pressures and temperatures are high enough to theoretically permit liquid water under certain conditions. RBX’s Hellas-Dao colony extracts water and other resources from this site. It seemed logical to me that a central hub with access to a spaceport and the machinery needed to distribute resources, etc, would make some kind of “capitol” necessary. For the capitol city of Dao, I chose a dome aesthetic — partially for the ease of pressurization, but also simply because I like the look. Graphic artist Stephanie Hoover did a great job rendering this aesthetic on the cover design. 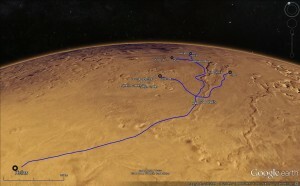 Google Mars image with overlay of fictional rail/supply lines for the Hellas-Dao colony. The executive offices of Rekos-Breland Mars took up the topmost floors of the tallest dome connecting to Spirit Plaza, in the center of Dao. The outer walls were almost entirely made of refined Martian silicates — delicate and clear, with the faintest wispy tinge of ethereal red. The one-way panes were scaffolded in triangles to curve over ten meters high to the tip of the dome. Those that worked in the building could look out in all directions at the surrounding city and beyond with a view that arched from the red mountains and ridge lines in the distance, upward to the cold, arid sky. A ring of office suites and conference rooms, separated by walls of transparent glass, made up the outer radius of the executive floor, surrounding an open toroid of cubicles for second and third tier administrative personnel. The decor was a blend of deep red polished marble, gunmetal steel, and dark woods imported from Earth, dotted with rivetingly green potted trees and succulents. In the middle of the floor loomed a silvered oblate spheroid that seemed merely decorative, but a seam on one side betrayed the shape of a doorway. Those who worked on the executive floor of RBX knew that the dome was only silvered on the outer face of the center office. Like a spider in the center of a web, anyone on the inside could see out in all directions with impunity. The majority of structure was underground, except for the top of the Donut and the garage. Underground structure made radiation shielding cheaper. Not everything could be made of the special-treated fiberglass of the Donut top, or barricaded under the water tanks like the garage. Living quarters were barely ten cubic meters. Anywhere possible, volume served two, three, even four purposes. Wall panels folded down into workspaces, on which pads could be unrolled to form beds. Sinks folded up to reveal toilets. Couches and other seats all doubled as storage containers. Everything was cramped. 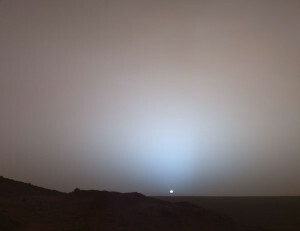 Sunsets are pale blue on Mars! This photo from the Spirit rover shows the last few minutes before dusk. 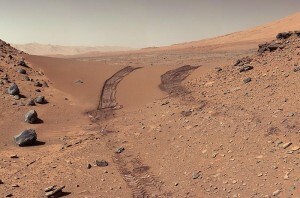 Image Credit: Mars Exploration Rover Mission, Texas A&M, Cornell, JPL, NASA. The apartment complex where Izar and thousands of other lower-class people live is described as similarly sparse. I think the ​concept of centralized farming and mining assumes that the only design driver for these systems is efficiency. We often forget that a real future for humanity in space means that real people will be living out there. This burgeoning population will not necessarily be the skilled, educated astronauts of government programs. 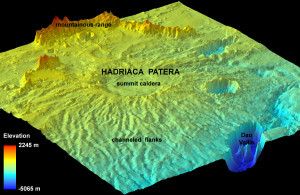 Elevation map of Mars near the Hadriaca Patera. They will need work, resources, entertainment, and goods to consume. As in the case of Red Soil, these people will be an opportunity for profit. A robot may be more efficient at the raw labor, but it will not provide a place for people to live, nor will it generate demand for consumer goods and entertainment that need to be sold. I had a wonderful time researching the setting for Red Soil Through Our Fingers. Though I tried to be as faithful as I could to our current understanding of Mars, no doubt I got a few details incorrect somewhere — and it’s also true that we are discovering new things about our planetary neighbor almost every day. Such is the challenge and beauty of trying to write “hard” science fiction, that which tries to stay as true as possible to what we already know about the universe. I’m excited to see what else about Mars I can work into the two planned sequels to this novel! 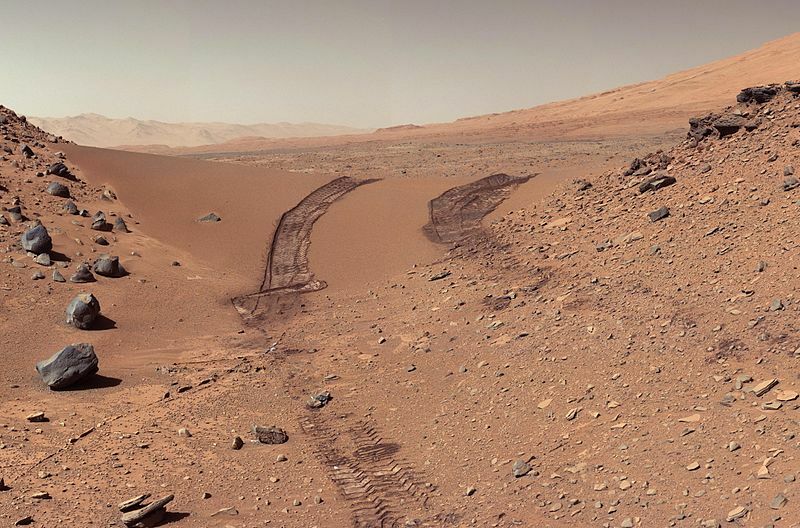 This entry was posted in My Stories and tagged curiosity, hard sf, mars, planet, red soil, rover, setting, solar system, spirit, worldbuilding by Nalin. Bookmark the permalink.